I've been a huge fan of this place ever since stevez told me back in April of 2012 that it had been acquired by 2 brothers, both long-time veterans of Greek Islands. I feel fortunate that it's near my office because it has become our ace-in-the-hole, go-to place for lunch; generally once a week. I also have dinner here on a regular basis. The menu is large but unlike large menus at so many other places, this one is deep with quality items. 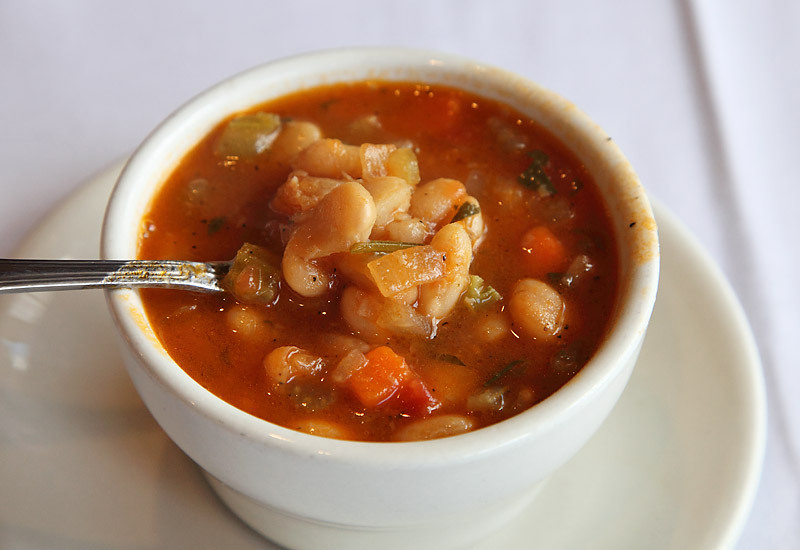 The daily, house-made soups (lentil, navy bean, fish, etc. ), whole grilled fish, grilled octopus, house-made gyros, braised lamb dishes, grilled lamb chops, keftedes, bekri meze, spanakopitakia, cold dips (taramosalata, tsatziki, skordalia, etc. ), salads (Chef George, Paschalini, etc. 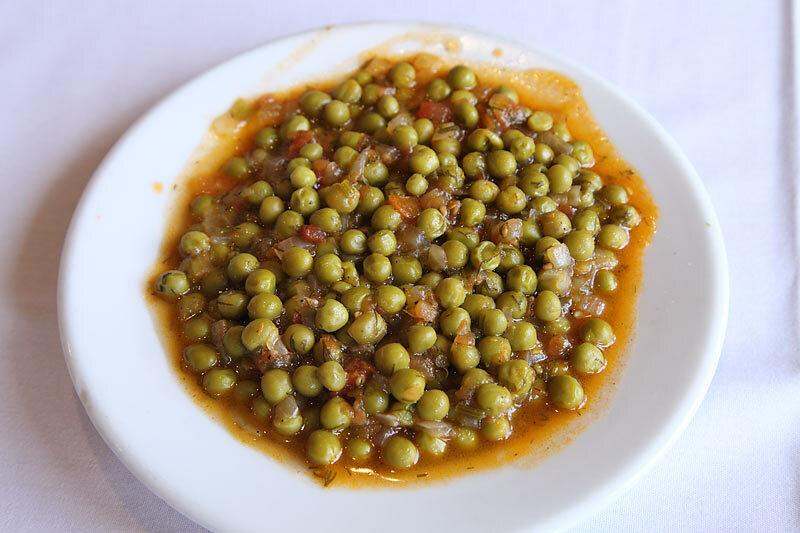 ), vegetable side dishes (peas, okra, green beans, etc.) and many of the specialty entrees (lamb hilopites, chicken spanaki, moussaka,etc.) are all highlights. Yes, it's possible to go wrong here but in my dozens of times eating in at Psistaria and carrying out, the instances have been extremely rare. Here are pics of a few of my top items . . . This one is served on Mondays, Wednesdays and Saturdays. It's not my very favorite of the house-made soups at Psistaria (that would be the lentil, served on Tuesdays and Fridays) but I always look forward to this one. They don't bake it here but it's delivered daily and it's always fresh. 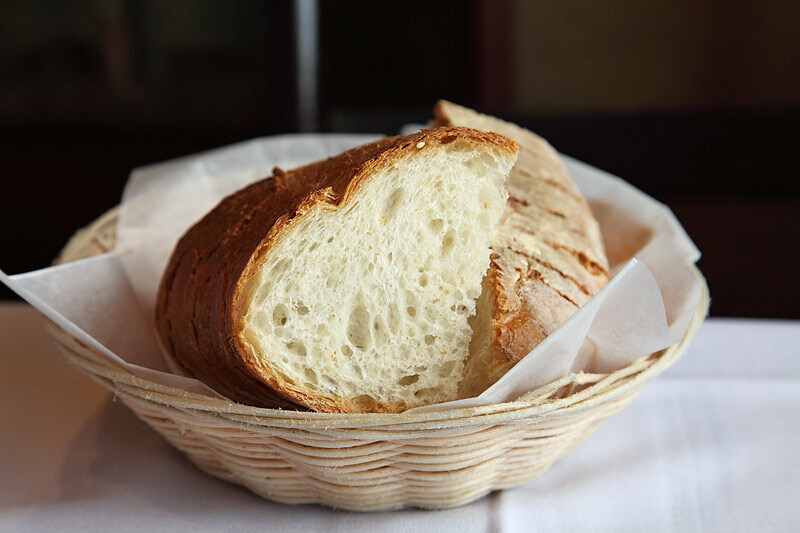 This hearthy bread has a great depth of flavor and is perfect for sopping up olive oil and sauces. The lighter sesame bread (not pictured) is also particularly delicious . . . especially with a big schmear of taramosalata on it. These peas are available every day. They're the best take on this type of preparation I've ever had. 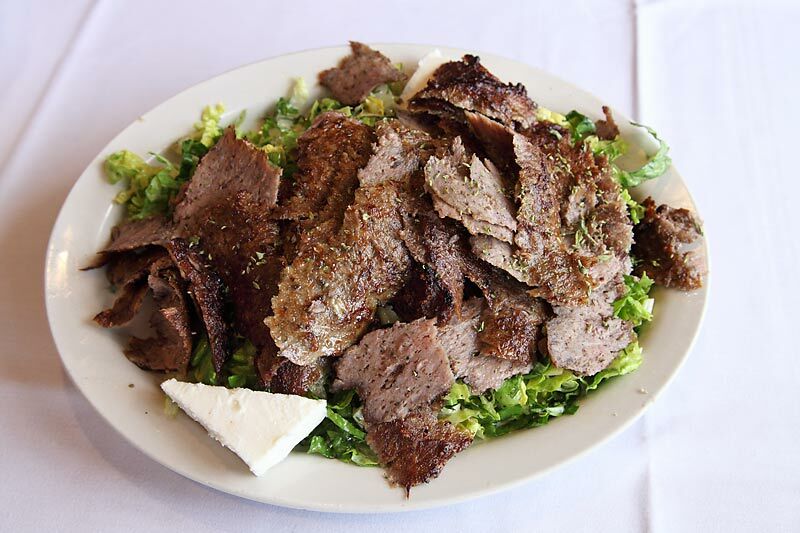 When I eat in, I often order a gyros appetizer as a topper to my Paschalini salad. It's a great combination, especially with the dill and scallions in the salad. Absolutely the best version of this dish I've ever had in a restaurant. So many people I know from within our community (and outside of it) consider Psistaria to be the new gold standard for traditional Greek fare. But looking at the main thread (link to first post after current owners took it over), I'm not convinced that that sentiment really comes through. Sure, there are plenty of positive posts but they don't seem to convey the enthusiasm with which people talk about this place in casual conversation, nor the frequency with which they eat there. My hope is that this nomination will inspire posts of support from some of Psistaria's fans here at LTH -- some of whom eat there regularly and speak glowingly about it but haven't yet posted about their positive experiences. At the very least, I hope it will inspire people who haven't been to Psistaria since George & Tom took it over to check it out. PIGMON wrote: Trix and I had an outstanding lunch at Psistaria in Lincolnwood yesterday. jvalentino wrote: Made my second trip here today, and again left very impressed. Had mostly duplicates from my first visit-whole fish, gyros which were great again. We also got the lamb riblets this time, and they were very good too. This place is doing it right. Dlongs wrote: The gyros are really great, nice and crispy. The tzatziki sauce is thick, tart, and has cucumber strewn throughout. ett094 wrote: the salads were very fresh, nicely cut and dressed, the octopus was wonderful, my fish was expertly grilled and the prices are very very reasonable. Entrees of lamb, whitefish, and shrimp were all exactly what you would expect at a top-notch Greektown place. Of the sides we had, the spinach rice and the roasted potatoes were the big winners. jay2021 wrote: We have been to Psistaria many times over the last year and I agree that the food is wonderful which is why we keep coming back. Sweet Willie wrote: had a cup of the lentil soup to start, which was VERY good, especially with bits of torn crust from the house bread I put in it as well as a splash of red wine vinegar (a small bottle of which is provided w/the soup). Darren72 wrote: My most recent meal was in November and it was outstanding. I was with a large group, so we were able to sample a ton of appetizers and good number of entrees. Nearly everything was fantastic. It was a Thursday night, if I recall, and they were quite busy. I eat at the Halsted Greek places a lot and my meal at Psistaria just blew away those experiences. So, for 2014, I enthusiastically nominate the very deserving Psistaria for a GNR. Wholeheartedly support this nomination! Our experiences here have been consistently excellent over the past two years. Also want to mention the warm and welcoming staff, attentive service, and the fact that they are very family/child-friendly. I especially remember seeing the fresh herb garden on the east side of the building. Not something I've seen at other Greek restaurants, and indicative of the care and commitment of the owners to doing things well. Excellent GNR. I consider this one of the most enjoyable restaurants to open up in the last several years. Their kalamari, George's Special salad, most soups, homemade gyros plate, Grecian chicken, and broiled stingray are all tremendous dishes. The love for this place within the North Suburban Greek community seems obvious as it's not at all uncommon to hear Greek being spoken at nearby tables on almost every visit. The owners of Psistaria are true marvels, always visible and making sure that everything is optimally humming from FOH customer satisfaction, table service, and food. An easy GNR selection if there ever was one. I have had several non-LTH meals at Psistaria with a group of gals whom I get together with a couple of times a year. Since suggesting Psistaria a couple of "lunches" ago, this is the requested location now, after years of Cheesecake Factory, CPK and similar venues. That's exactly how I use the GNR list--as a way to get a delicious, reliable, "cut above the fray" meal that can appeal to more than just "foodies". Additionally, I judge all Greek restaurants on one very key dish--the Taramosalata--if it's good, I'm good. If it's great, I find reasons to get there. And Psistaria's is one of my favorites in Chicago. I support this nomination, as might be deduced from my comments in the main Psistaria thread. We eat at Psistaria every few months, and it is always excellent. I am in complete agreement with boudreaulicious on the taramosalata as a gauge of a Greek restaurant and as an excellent version at Psistaria. Their fresh fish is a favorite, as are the soups, octopus, and the Spanakopitakia (my daughter's usual order at any Greek restaurant). It's a bustling and friendly place where everyone seems to be having a good time whenever we go. We're glad to have it close by. GNR - yes! I would love to see this "win". I often think fondly of their skordalia. Being able to walk over to Psistaria for a delicious cheap lunch is one of the few things I miss about my old job. It takes a lot to get me get on the Edens. This is one excellent reason. I've enjoyed some wonderful meals here in the last yr. Whether it's a business lunch or a family dinner, Psisteria has become a go to restaurant for me ever since Tommy and George moved up from Greek Town and bought the place. For me, Psisteria has the added benefit of actually being in my neighborhood. I'm addicted to the crispy fried zucchini served with garlicky skordelia, the grilled octopus, the house made gyros and the homey soups, not to mention the excellently prepared fish. I've also had wonderful food here, but we really did have a horrible, unacceptable service situation last year (mentioned up thread) and cannot get my husband to agree to return, at least for dinner. I might reconsider for lunch but he is adamant. Don't want to be a buzzkill but felt I needed to throw that out. Had a very good dinner at Psistaria the other night. Coincidentally, we were there while they were showing them on Check Please in the bar. I'm equidistant to Greektown and Psistaria and I will always choose the latter over the former. GNR in my book. I can wholeheartedly endorse this nomination. We had a terrific meal here tonight. Great service, huge portions, very tasty food. Good food and service, nice people, terrific GNR nomination. Psistaria, count me a fan. Yes the attention and extras are up a notch when accompanied by our Greek speaking friends but even without, the food is always delicious. For Greek-Town style I put them in my, best of, in the strong trio of Skordalia, Soups and any braised-grilled Lamb preps. Love the Araka too. Another vote here. We love Psistaria and eat there as often as any restaurant. True, service can be spotty, but I think any high-volume, high-traffic, big room restaurant like this can have some service glitches during their busiest times. 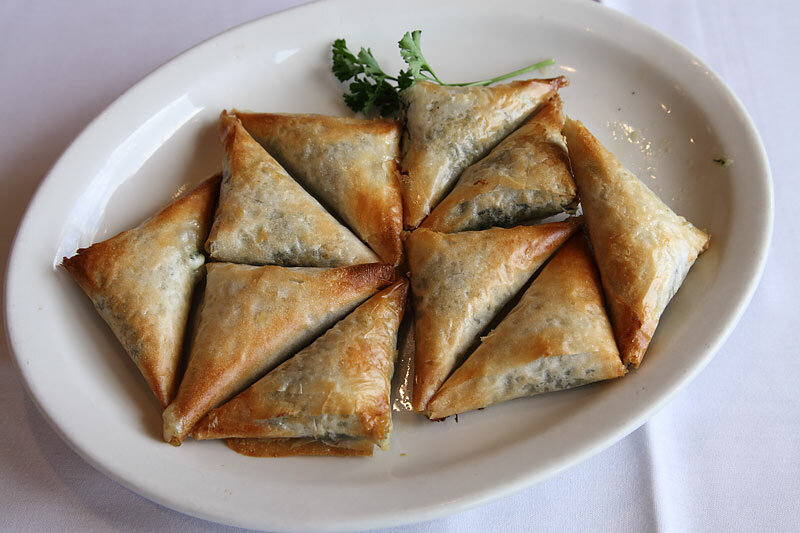 We gladly forgive for our long list of menu favorites: terrific skordalia, taramosalata, melitzanosalata, fried zucchini, grilled octopus, the house-made gyros, and the broiled chicken. Psistaria is a great nomination and an important addition to the GNR list. My parents regularly ate at Psistaria over forty years ago and raved about the incredible amount of food you got for very little money. I always meant to try it out, especially since I stopped at NYBB across the street far too frequently, but never got there until Ronnie posted about the makeover it received. I've eaten there a handful of times, both dine-in and carry out, and have been incredibly impressed by nearly every dish I've had. I work near Greektown and eat at those restaurants a lot. I've grown to like them, but Psistaria is a major step up in quality and execution. Psistaria's location makes it a great addition to an area that needs more good dining options. I vote yes for a GNR. Two more votes from Fifille and myself. Had a great meal here last Friday. Grilled, baked, fried, or sautéed, the kitchen turned it all out excellently.